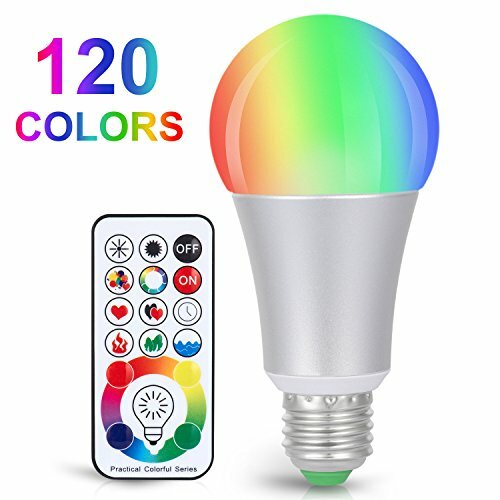 120 COLOR CHANGING: 4 main colors in the color plate including Red, Yellow, Green and Blue. 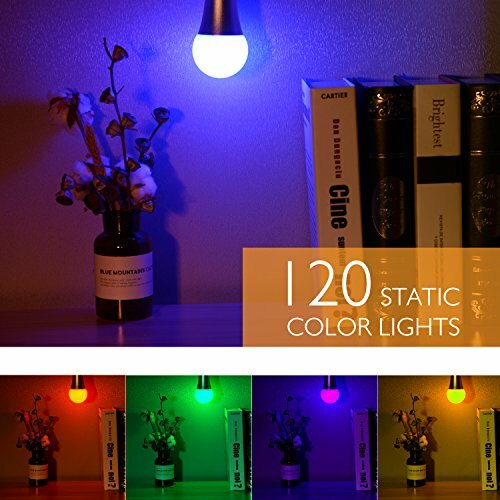 Based on these primary color, it allow you to select 120 static colors as your DIY colors to set on the controller (included). 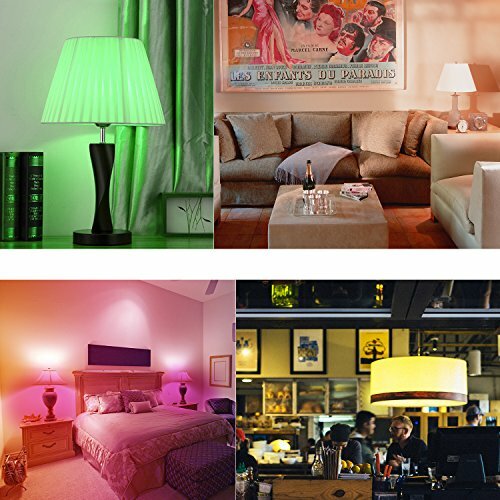 ADJUSTABLE SPEED AND BRIGHTNESS OF ILLUMINATION: 5W “RGB” + 10W “W” (equivalent to 60W incandescent white bulb) and different speed set by the remote not only can provide you life illumination but create atmosphere in various scene. 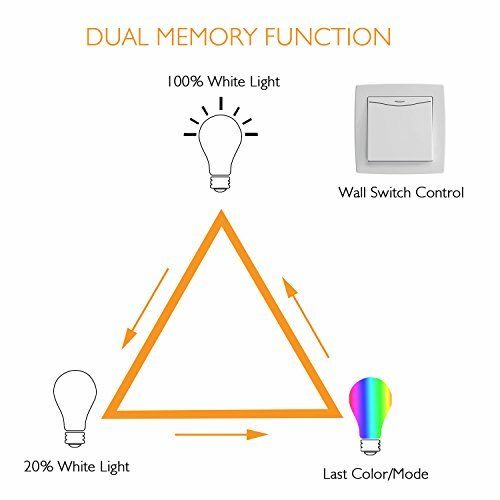 DUAL MEMORY FUNCTION: Once you press ‘OFF’ and ‘ON’ of the wall switch within 3s, the light will be rest to white color. Turn on the light after turning it off for 3s, it will stay the last color/mode. 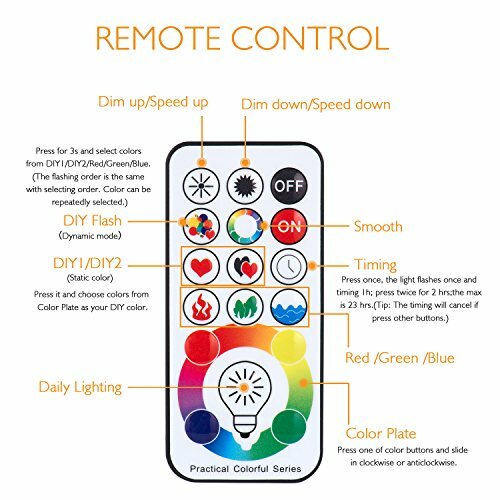 Even if the remote can not be found, you can reset the bulb light to white color by the easy way. 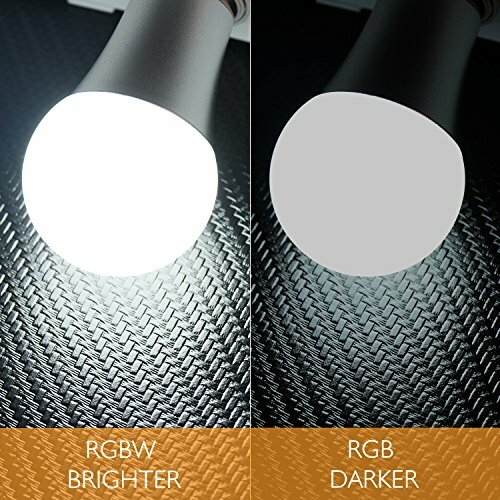 ☆RGBW LED light bulb integrates ordinary white light and colorful light into one. ☆Easily create any atmosphere you want in one second. ☆No need extra installations or complicated wires. 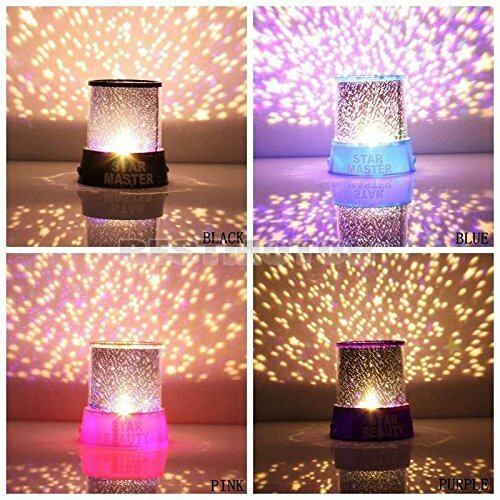 ☆Just press the wall switch or remote controller, and you can enjoy colorful light immediately. 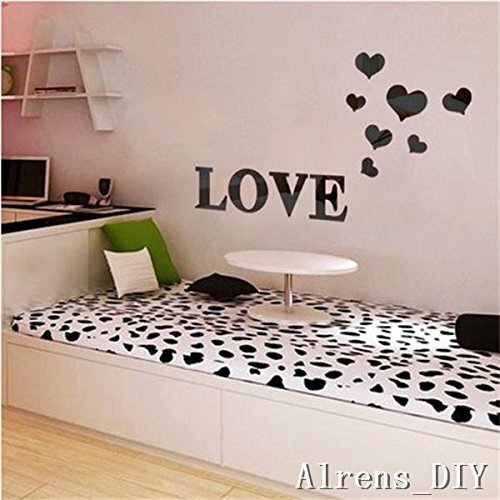 ☆It is absolutely a perfect home decoration for daily use, parties, weddings, holiday celebrations and so on. ☆Memory function remembers your settings when you turn on it next time. The timer function will cancel if you press any other buttons and turn it off after your setting timer. ONE YEAR replacement and refund warranty. If you have any questions or dissatisfactions, please contact us immediately. We will solve your problems within 24 hours. 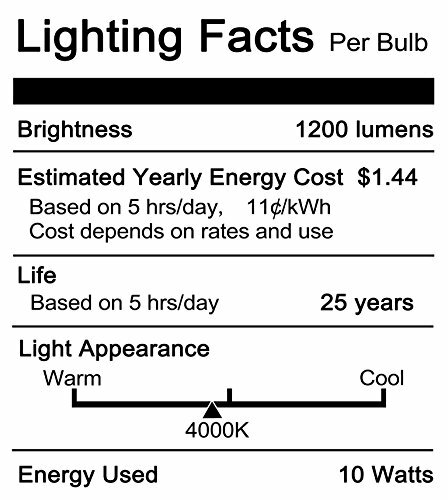 TIMING FUNCTION: This bulb can auto off by setting timer service. If you need to turn it off 1 hour later, just press the button once, 2 hours by pressing twice and so on. The maximum can take up to 23 hours. 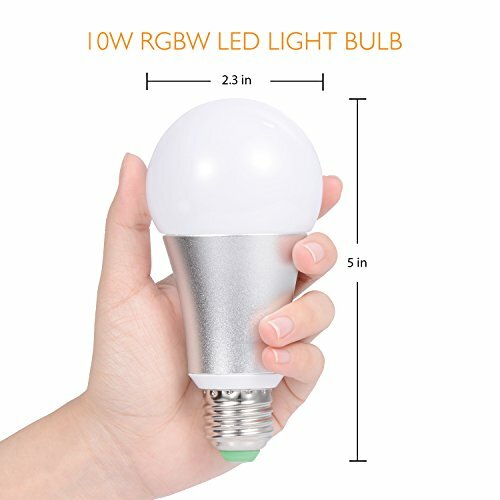 LONG SERVICE LIFE: The RGB LED light bulb with 50,000 hours lifespan is perfect for household and holiday use. 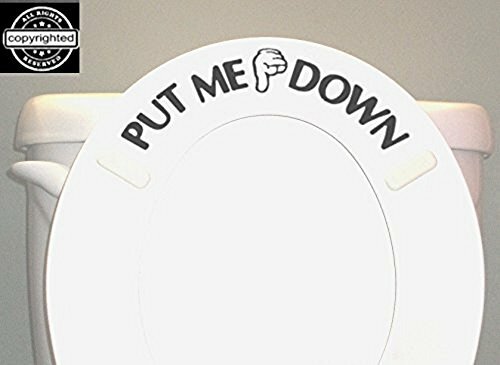 It is an ideal gift for your family and friends. We will provide ONE YEAR replacement and refund to ensure risk-free purchase for you.